Although stable systems for fire extinguishing with water mist have been known for decades, they were not used in south-east Europe until recently. In the past few years, several companies have engaged in designing and installing stable water mist systems, whereby finely dispersed droplets of water use physical properties more efficiently than conventional sprinkler systems. The water passes through special nozzles at a high working pressure and is atomised to sizes up to 1,000 microns. Due to the extremely small amount of water that is used, the potential for damage from water during fire is reduced to a minimum. In this article I will deal with the difference between classic sprinkler systems and water mist systems using Computational fluid dynamics – usually abbreviated as CFD – a branch of fluid mechanics that uses numerical methods and algorithms to solve and analyse problems involving fluid flow. Computers are used to perform the calculations required to simulate the interaction of liquids and gases inside a defined area. The basis of almost all CFD models are the Navier-Stokes partial differential equations, which define any single-phase fluid flow. For the purpose of this research Fire Dynamics Simulator (FDS) was used with the addition of the commercial version (2012) of the Pyrosim graphical interface (created by Thunderhead Engineering), developed for post-processing of the results obtained by modelling the FDS. FDS models can predict smoke, temperature, carbon monoxide and other substances during the fire. Simulation results are used to verify the safety of the building before construction, evaluate the security options of existing buildings, carry out the reconstruction of fire during the investigation of fire causes and assist in the training of firefighters. Pyrosim interface provides immediate feedback and ensures proper form for FDS output file. Both examples in this research are basically modified examples that come with PyroSim. 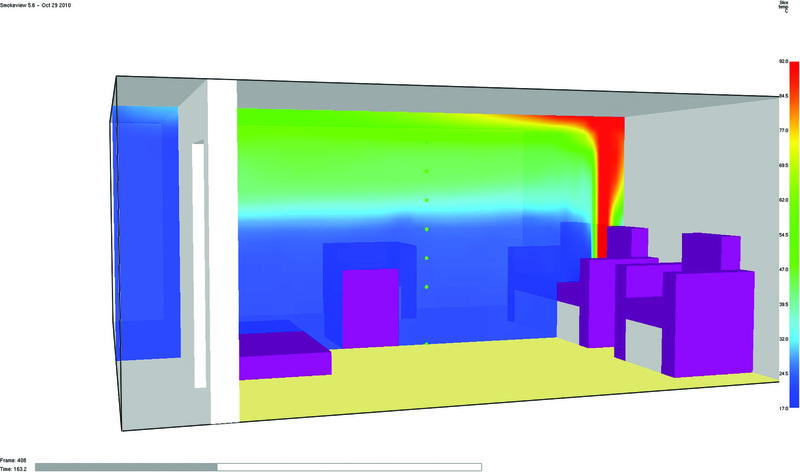 Example One is a model of the development of a fire in a room that simulates a living room. The room dimensions are 5.2 metres by 4.6 metres by 2.4 metres high and its volume is 75.4 cubic metres. The whole unit is defined with a mesh structure consisting of a ten centimetre cell size and the total number of cells being 67,392. The source of the fire is on the central part of the sofa, and the heat release rate per area is 1000 kW/m². Above the sofa is a classic sprinkler nozzle, while in the second situation the classic sprinkler is replaced with a water mist nozzle. Simulation time is 400 seconds. Activation temperature of the nozzle: 74°C. Number of droplets in one second: 5,000. Droplet diameter: 4,000 µm (4 mm). Number of droplets in one second: 384,000. In this example, both nozzles were activated after 165 seconds from the start of the fire, which was expected because in both cases the activation temperature was the same. In the case of the sprinkler the temperature gradually fell from 97.5°C to 65°C. After 200 seconds from the start of the fire, the temperature above the sofa decreased to approximately 70°C. The sprinkler successfully lowered the temperature and prevented further spread of the fire, but did not completely extinguish the fire on the sofa. Only a few seconds after the activation of the water mist nozzle, the temperature was lowered from 89.5°C to 45°C. After 200 seconds from the start of the fire, throughout the room the temperature dropped to 25°C. The water mist nozzle completely extinguished the fire in the room and lowered the overall temperature to 25°C. Example Two is a model of development of a fire in a room that simulates a kitchen. The room dimensions are 6.4 metres by 4 metres by 2.4 metres high and volume is 61.44 cubic metres. The whole unit is defined with the same size mesh as Example One, and the total number of cells is 245,760. In the middle of the kitchen is an installed classic sprinkler nozzle in the first case and, in the second, this is replaced by a water mist nozzle. Both nozzles have the same specifications as in the Example One. The source of the fire is set on top of one of the kitchen’s cabinets, simulating fire from cooking stove. Simulation time is 400 seconds. Both nozzles activated three seconds after the start of the fire. In the case of sprinkler the temperature was maintained between 80°C and 90°C until the end of the simulation. The sprinkler did not lower room temperature under 80°C, but it prevented further spread of the fire in the given time. After activating, the water mist nozzle temperature was lowered from 74°C to 40°C. 30 seconds later the room temperature varied between 25°C and 40°C, and it did so until the end of the simulation. The water mist nozzle successfully lowered the temperature and prevented further spread of the fire in the given time. Although the fire was not extinguished until the end, the temperature was lowered to an acceptable level (between 25°C and 40°C) enabling the safe evacuation and easy access for firefighters. 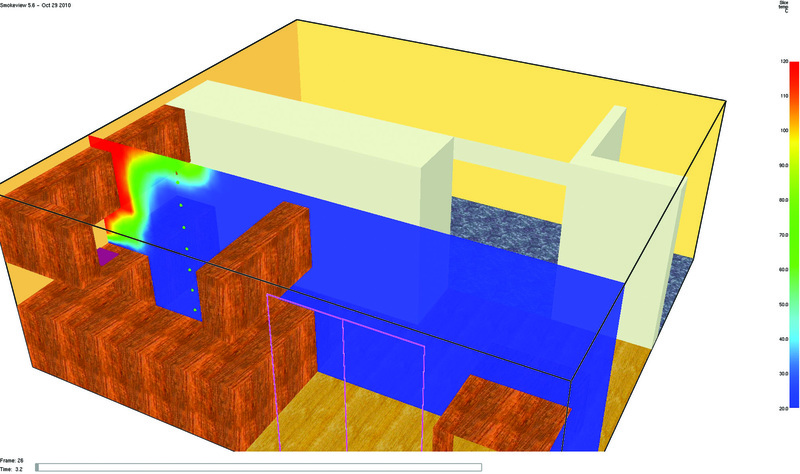 Based on the CFD modelling and analysis of the obtained temperatures, we can conclude that the water mist system is several times more efficient than the sprinkler system in residential areas (living rooms and kitchens). In the first example, water mist drastically lowered the overall temperature and almost completely extinguished the fire that originated on the couch. A similar conclusion can also be made for the second example. Although the water mist system did not completely extinguish the fire, it maintained it around 30°C until the end of the simulation, while the classic sprinkler failed to lower temperature below 90°C until the end of the simulation. A water mist system must not be seen only as a system that effectively absorbs the heat in relation to the classic sprinkler, but as a system that creates a hypoxic environment. Due to rapid evaporation and expansion of water vapour, it leads to the displacement of oxygen and reducing its concentration. The intensity of the fire is decreasing significantly when reducing the percentage of oxygen in the atmosphere. Also, in the end, it is important to once again conclude that the water mist system with reduced temperature to a much lower level compared with the conventional sprinkler system in the shortest possible time. In this way, evacuation time of the affected area is increased and the damage caused by a fire is reduced.